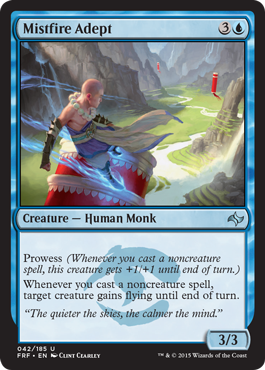 Today I’ll be going over the blue cards in Fate Reforged. At first glance, RUW seems to be the color combination to benefit the most from this set. There are a large amount of cards with the Jeskai mechanic Prowess on it in blue, and a few cards with Sultai effects and Delve. Know what’s missing though? Just about any type of blue Temur card. It seems like URW is being pushed pretty heavily in this set so far. It’s my guess that we’ll see a lot more RUG based effects in Dragons of Tarkir in 3 months, which is why there is absolutely nothing at the moment. Well, we don’t have a lot of time before the pre-release so lets get through the cards. Just as I said with Lightform in white, I would definitely pay 3 mana for a 2/2 flyer with hexproof. The effect might not be as strong as a Lifelink on an empty battlefield, but it does protect your creature from being killed before you can flip it which is a plus. 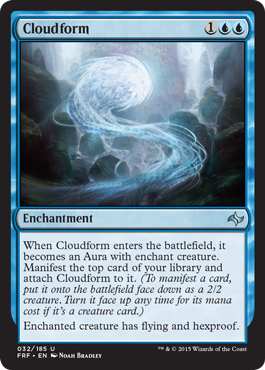 This card would work well with a strong Temur or Jeskai Prowess creature I think, but that double blue mana cost might be a little tough for some decks to cast. 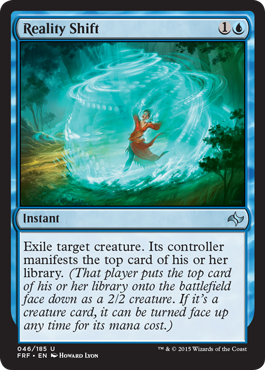 The evasion and protection still puts it high on my list of playable cards in blue though, and it even has me thinking of possible applications in standard with mono blue devotion. I think I’d take it pretty high in draft, especially if I grabbed a few good bombs/finisher already. Fascinating indeed. Draw a bunch of cards late in the game in a Jeskai/Temur deck to put pressure on your opponent, or fuel your Delve creatures/spells in the mid game in a Sultai deck. It would be great at instant speed, but I think it will see some limited play in its current form as well. It’s a great enabler for what you need it for, and I feel there are quite a few cards in this set that have this sort of duality. Giving both players cards might not be a great effect, but the second effect is definitely something I’d want in a Sultai deck with cards like Shrieking Mandrills or Murderous Cut. I’d especially like this if you get a Sidisi in your packs. I’m sure your opponent is only going to have 3-4 kill spells on average in their limited deck, and it’s doubtful that they’ll have it on turn 2 or 3 to deal with this guy. 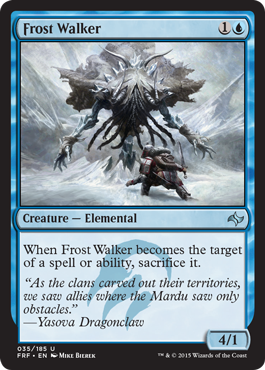 I see Frost Walker has a powerful glass cannon that can get in a lot of damage early if your opponent’s deck is slow, and it also trades with a lot of cards midgame as well. Not a high pick in draft, but something that I’d considering playing in the 2 spot alongside other fast creatures like Seeker of the Way in a Jeskai build. Another solid Jeskai card. He has an alright 2/3 body for 4 mana, and flying + Prowess is a good combination. Aside from dragons, I don’t think he’ll have that many problems getting through many of the other flyers in play. He can get around pesky cards like Alabaster Kirin with a well timed spell, and a well timed burn spell can allow him to survive a Wingmate Roc attack while taking out their win condition. 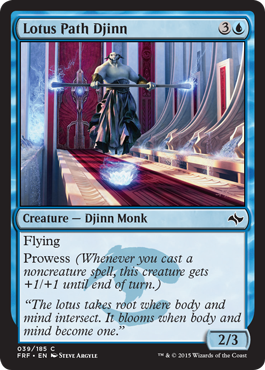 I think Lotus Path Djinn will see some play in KTK/FRF limited, mostly in Jeskai decks but in Sultai ones as well. This guy isn’t bad alongside Mystic of the Hidden Way in blue decks. His power level is somewhat lower, but his ability gives you a lot more options. 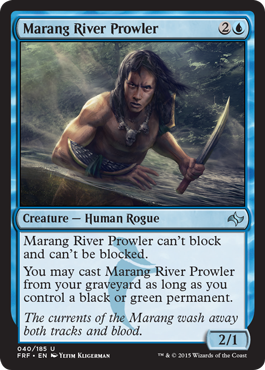 If you want to play a faster deck to get around those late game 4 and 5 color decks stacked with morph, consider running the Marang River Prowler. He combos nicely with Merciless Executioner, and also is a card you want to be playing if you have a lot of Looter effects such as the one that comes with Force Away or on Jeskai Elder. High pick I think. I could see him being a role player in just about any blue deck, play both offense and defense. NICE. Evasion + auto mill. You can mill your opponent out while killing them in the air. You’ll probably kill them before you mill them out, but it’s still relative card advantage. Every card you put in their graveyard is one less problem you have to deal with. Want to know what’s even better? It says TARGET PLAYER puts 4 cards into their graveyard. Maybe you can only sneak in an attack or two in and are playing a heavy Sultai Delve deck. Well, Mindscour Dragon can help you out with that and give you the fuel you need to power out a Temporal Trespass or Dig Through Time. Like I said, Fate Reforged has some tricky cards, and these type of choices are going to add a lot more strategy and depth to the limited format. If you’re playing a Jeskai Prowess/tempo deck, you’ll definitely have a few more spells than usual in order to activate it. Prowess looks like it’s reaching a saturation point in FRF/KTK limited, which means Misfire Adept could end up being REALLY good with the right cards. You don’t have to be afraid to play a critical mass of 2 and 3 drop creatures with prowess any more. Play them and then watch them fly over your opponent’s head for the win. I’m really starting to think that Jeskai will give Mardu a run for its money as the premier aggro strategy in sealed and draft. Watch out for this card. I’d probably take it highly in draft. Get rid of their finisher, give them a 2/2. This doesn’t feel like something blue should have, but heck, I’ll take it. If your opponent opened up a bomb such as one of the dragons, you’ll be grateful to have this in your arsenal. Of course you don’t have to use this on only your opponent’s creatures either. If one of your creatures is going to die anyways, exile it so you can get some card advantage. Being able to decide whether you want to use it as a 2/2 creature on turn 2 in an aggressive deck or to hold onto it in a slower Temur or Sultai build as removal makes this a great card to have. Not something I’d take first in draft, but it’s something I’d value very highly. Another neat blue card. It’s a great way to set up your next turn, and does 2 things with one card. If you see two lands when you look, make one a 2/2 and put the other on the bottom. Maybe you want to draw that card? Put it on top after manifesting the first one. This is also a good way to make sure you’re not manifesting your instants and sorceries (which can be pretty important in limited). While it’s neat, it’s not absolutely necessary. Depending on your deck’s synergy you might or might not want to play it. I see it working well in Jeskai, and maybe Temur builds, but not being that great in Sultai decks. I would strongly consider playing this as my 22nd or 23rd card though if I had nothing else better to take it’s place. I’d much rather play this than a plain 2/2 bear in the 2 drop position. Jeskai Runemark – not sure if it deserves a spot in your 22-23 cards or not. Flying with +2/+2 seems strong, but you always run into the possibility of getting Two for Oned and losing both cards. This is why I like Cloudform. Aven Surveyor – a Blue/x flyers deck definitely seems like a reality with the addition of this set, but Aven Surveyors seems a bit expensive for what it’s offering. A 3/3 flyer for 5 mana is borderline, as well as a 2/2 flyer that bounces a creature back to its owner’s hand. Rite of Undoing – Saves a card from destruction, and also gets rid of their pesky permanent. 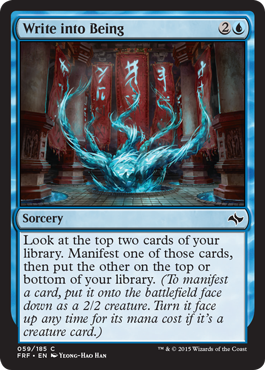 If your opponent is playing powerful Planeswalker Cards like Sarkhan or Sorin, and is about to use their ultimate power the following turn, Rite of Undoing might have something to say about that. Sultai Skullkeeper – Good synergy with Delve decks. I’m really surprised and excited about blue’s possibilities in the next set. I mean, damn. 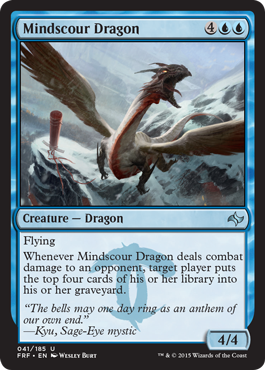 Blue already had great cards like Treasure Cruise and Dig Through Time, but Fate Reforged will do a lot to increase the presence of this color in limited. I expect Jeskai to be a standout color combination as the weeks of limited go on, and Sultai decks won’t be too bad either. For me, the pre-release is happening in a little under a day, but that still gives me another 24 hours to give my readers some more insight on what limited is going to be like starting next week! What do YOU think of blue at the moment? If you have any other thoughts or want to suggest some combinations/synergies, I’d love to hear them down below. Check back tomorrow for the best black cards in the set!